Electric Windows. Electric Mirrors. Very nice and powerful drive. Body's in nice condition - just a couple small scratches, nothing serious. 4 x Good Tyres. 3 MONTH WARRANTY. Only 2 owners from new. MOT till end of August 2019. 1 YEAR MOT. CAR IS IN A LOVEY CONDITION. BMW 116D 116 D, 2.000 CC DIESEL 5 DOOR IN BLACK. AIR CON, 6 SPEED GEARBOX ,121 BHP, ONLY 109 THOUSAND MILES WARRANTED WITH HISTORY. ONE YEARS MOT AT POINT OF SALE. NOW THE CHEAPEST AT £2950 AND IN GREAT CONDITION. BMW 320d SE Coupe. 2010 60 Plate 184bhp. BMW Professional Head Unit, Zenons, LED Lighting, Alloys, Reversing Sensors, Sunroof, Pillarless Windows, Entry Assistance, Seatbelt Assist, Bluetooth Adapter, Auto Lights, Auto Wipers. My bmw 320d. MY 2007 BMW 320D Very Clean Low Mileage Just over 80.000. Electric Windows. Start Stop System. Xenon head lights. Full service history. Just had a service which includes. cabin filter. 12 months Mot. Stop start button. Half leather seats. Clean outside and inside. Full history service. Here is my own 2001 BMW 728i Facelift Sport. Mot January 2020. Just needs a set of style 32s or parallels to really set it off then you will have a low mileage run out model sport. Just 94,000 miles from new. 2007 BMW 320 D SE Automatic 2 owners with 142000 miles with FSH and superb. Clearly well looked after and driving superbly complete with 2 keys, full years MOT and 3 months extendable warranty. Fully loaded SE spec with front and rear parking sensors. Aux input. Alloys and cloth interior. Full-service History. 12 Month Mot. Lady owner last two years. Clean bodywork and drives well. Car has been well looked after. Bmw 2008 123d. Coral sport leather interior. 18” alloys with sport tyres. clean unmolested example. Remapped, fresh mot, recent dpf, clutch, flywheel, waterpump. USB and bluetooth. Cash on collection only. Auto light, wipers. Car drives faultless. Dent on drivers side rear arch see photos. Full service history. BMW 320D SE TOURING AUTO ESTATE DIESEL CAR. 2.0 DIESEL, PUSH BUTTON START/STOP. REAR PARKING SENSORS, ELECTRIC WINDOWS, AIR CON. 2006 MODEL, ONLY DONE 133,000 MILES. FULL MOT HISTORY, WELL MAINTAINED, ALUMINIUM TRIM. BMW 320D SE 184 BHP (the better engine). H.P.I clear. 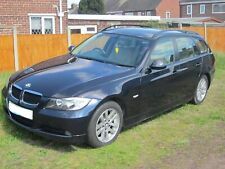 2009 BMW 520d Automatic Diesel Estate. Trade Sale with no warranty implied or Given. The smooth ride and handling characteristics make it a very comfortable short and long distance vehicle. MOT until: 26th November 2019. 2004 BMW X5 3.0 D SPORT IN BLACK. If you fail to do this the car will not necessarily be held for you. If this does not sound like you then you might want to consider buying your vehicle elsewhere. Bmw 330 d touring in lovely conditions. xenon lights and automatic lights. Panoramic sunroof. Drives amazing. Headlights washers. Car was a cat N with only drivers door needed replacing. I have all the booklets but no service history (you can check with Vosa). I have serviced it every year that I have owned it.